Although registered since 2005 - finally managed it to become a member in here. My favourite German speaking forum is going down by the minute - say thanks to Facebook an co. I try to move over here with my project thread I'd running since 15 years. I'll come up with actual build in the news few days /weeks. Top speed runs are killers no matter how well the car is set up. Wowowowowowowowow no words, can't wait! Nicely done, looks high tech! Ok, letz start first with a mini update. This winter a small engine revision. New rockers, lifters, oil spray bars, Tomei RAS und the very new Tomei 258 cams. But more important were another things to get sorted out. Decided to remove splitfire ignition system and bought brand new OEM instead. Also removed the Tomei Oil Block since I always had trouble cruising on highways with oil temp going lower than 80. Installed the OEM heat exchanger instead. had to machine the o ring grooves by myself since only the remote side of the circuit sports have threads for sensors. And, i'd to sacrifice my HKS intake for my next toy. Last edited by geiserp; 11-02-2019 at 14:08. That is Turbo Number 5. Or six. I don't know. Say hello to GTX2860 gen II which will take place instead of my good old HKS GTSS. The copper gasket ist from frsport. Woulden't buy it again. Took ages to get it tight. Had to fab' up the wastegate bracket by myself since the hks bracket won't fit GTX Turbos. Last edited by geiserp; 11-02-2019 at 14:09. 'Titanium' Heat shields from DEI. Not a beauty but i'll do the job. New this year I started to print not only brackets or cable holder, but also functional parts printed in ABS-X. Here a BOV return hose. Added a Greddy water surge tank, removed the ugly wiring loom along the valve cover, and as mentioned the bov return tube should run along the downside of the engine. Last edited by geiserp; 11-02-2019 at 14:17. Will you wrap the exhaust elbow and downpipe as-well? 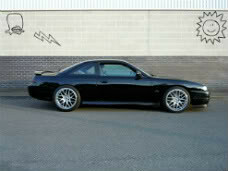 Been looking at these turbos for ages trying to convince myself its worth it on a daily driver, your setup looks sweet! How well does the turbo blanket fit? could you not use the oem s14a actuator and bracket? Can you easily change the spring in the HKS one? I like the look of the elbow, think will leave it as it is for now. :Been looking at these turbos for ages trying to convince myself its worth it on a daily driver, your setup looks sweet! I'm more interessted in quick turbo response as boot till redline, so that's why i've choosen this turbo. the new gt25-550 is maybe an option you should look at. : How well does the turbo blanket fit? If fits, but not very well, it is a bit too large. could you not use the oem s14a actuator and bracket?? No way, the new GTX compressor housings doesen't have the threads outside as the old gt turbos have. They are inside. However there are universal brackets you can use. Look at the very first turbo pics I posted, you won't see any threads. You don't need to change the spring, you adust the wastegate preload with the screw nut. the new gt25-550 is maybe an option you should look at. The outlets are all V-band so not wanting to go down the custom route as I will eventually swap my spare VQ35 engine in, so need to make use of the parts I have. Quite new to this turbo business so thanks for clearing up the wastegate question, been used to superchargers on my VQ's. Cool looking build. Engine bay is very bling! Have the tomei 258 replaced the 260? as the 260EX has become discontinued.